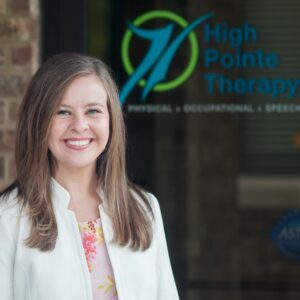 Speech Language Pathologist ~ Sarah became part of the High Pointe Therapy team in June 2018. She is originally from the Pacific Northwest and received a Bachelor of Arts degree from Eastern Washington University in 2007. Prior to pursuing speech-language pathology, she worked as a victim advocate and regional manager for a non-profit organization in addition to helping to develop a university clinical trial center. Inspired by her passion for helping people and interest in all things language-related, she attended Southern Connecticut University where she earned her Master of Science degree in Speech-Language Pathology in 2015. She speaks Spanish, is certified in Teaching English as a Second Language, and has specialized experience working with bilingual (Spanish/English) children with speech and language disorders. Sarah and her husband, Matthew, were married in 2010 and located to the greater Nashville area in 2015. They live on a small farm in Joelton with a garden, horses, and cats. In her free time, Sarah enjoys outdoor recreation, quilting, traveling, and Bible study.